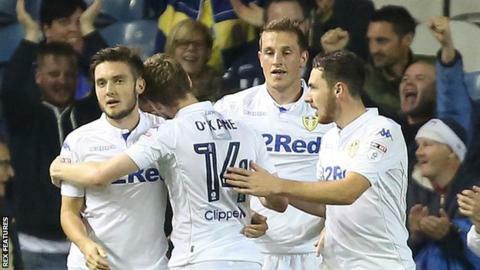 Substitute Chris Wood bundled in a late winner to give Leeds United victory over Blackburn Rovers in a scrappy EFL Cup third-round tie at Elland Road. The 24-year-old found the net with a follow-up header in the 85th minute after his initial effort was saved. It is the second time in seven days the striker has scored against Blackburn, having netted in the league fixture between the sides on 13 September. Charlie Taylor ensured the victory with a goal-line clearance in added time. Only 8,488 supporters were in attendance to watch a largely dour match between two sides that made 16 changes between them from the previous weekend's league fixtures. The second half was more lively than the first as both managers made attacking changes to positive effect. However, where as Rovers substitute Marvin Emnes saw his big chance saved by the legs of keeper Marco Silvestri, Wood would not be denied when his moment came. It was the New Zealand international's sixth goal of the season and gave United a third win on the bounce in all competitions. Leeds assistant manager Pep Clotet: "We're delighted because it was a hard start to the season. "We worked very hard. The commitment of the players has always been there and their hard work has paid off with three wins in a row. "But at the same time we'll keep our feet on the ground because we know how hard it is to win games in the Championship. "The good thing this team has done is to have a difficult start and get back into it with a lot of confidence and hard work. Whatever setback we find in the future, we know we have the tools to stand up and keep fighting for the club." Blackburn manager Owen Coyle: "Do we feel aggrieved to be out of the cup? Absolutely, because I think we put enough in to still be in it. But the margins are very fine. "Given how many changes we made, I thought it was a very good performance. "We're moving in the right direction, but we knew we would be." Match ends, Leeds United 1, Blackburn Rovers 0. Second Half ends, Leeds United 1, Blackburn Rovers 0. Corner, Blackburn Rovers. Conceded by Lewie Coyle. Connor Mahoney (Blackburn Rovers) wins a free kick in the defensive half. Foul by Matt Grimes (Leeds United). Attempt blocked. Hope Akpan (Blackburn Rovers) right footed shot from the centre of the box is blocked. Delay in match Eunan O'Kane (Leeds United) because of an injury. Marvin Emnes (Blackburn Rovers) is shown the yellow card for a bad foul. Foul by Marvin Emnes (Blackburn Rovers). Eunan O'Kane (Leeds United) wins a free kick in the attacking half. Corner, Leeds United. Conceded by Hope Akpan. Goal! Leeds United 1, Blackburn Rovers 0. Chris Wood (Leeds United) header from very close range to the high centre of the goal. Attempt saved. Chris Wood (Leeds United) right footed shot from very close range is saved in the centre of the goal. Attempt saved. Pablo Hernández (Leeds United) right footed shot from the centre of the box is saved in the bottom right corner. Substitution, Leeds United. Matt Grimes replaces Alex Mowatt. Darragh Lenihan (Blackburn Rovers) wins a free kick in the attacking half. Foul by Chris Wood (Leeds United). Hope Akpan (Blackburn Rovers) wins a free kick in the attacking half. Darragh Lenihan (Blackburn Rovers) is shown the yellow card for a bad foul. Foul by Darragh Lenihan (Blackburn Rovers). Kemar Roofe (Leeds United) wins a free kick in the defensive half. Corner, Leeds United. Conceded by David Raya Martin. Foul by Jason Lowe (Blackburn Rovers). Liam Cooper (Leeds United) wins a free kick in the attacking half. Foul by Liam Feeney (Blackburn Rovers). Liam Cooper (Leeds United) wins a free kick on the right wing. Attempt missed. Pablo Hernández (Leeds United) right footed shot from outside the box is too high. Kyle Bartley (Leeds United) wins a free kick in the attacking half. Attempt saved. Kemar Roofe (Leeds United) header from the centre of the box is saved in the centre of the goal. Substitution, Leeds United. Chris Wood replaces Marcus Antonsson. Attempt missed. Elliott Bennett (Blackburn Rovers) right footed shot from the right side of the six yard box is close, but misses to the right. Corner, Blackburn Rovers. Conceded by Kyle Bartley. Attempt blocked. Marvin Emnes (Blackburn Rovers) left footed shot from the centre of the box is blocked. Liam Cooper (Leeds United) wins a free kick on the left wing. Substitution, Blackburn Rovers. Connor Mahoney replaces Martin Samuelsen.